Whether you are new to social media or if you have been using social media for years, implementing demand generation strategies will help you deliver highly qualified prospects to sales. 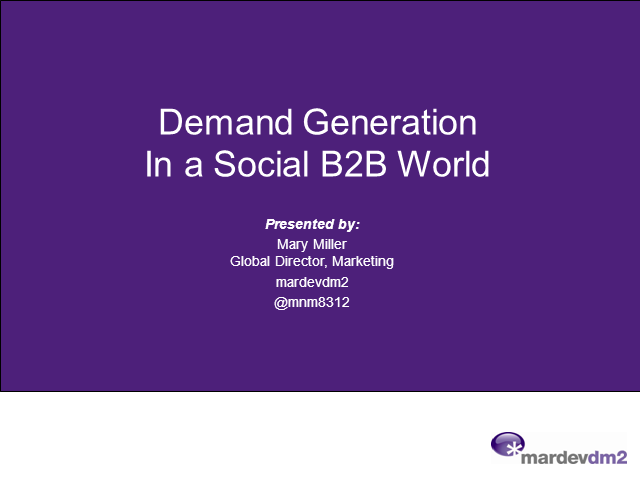 In this webcast, Mary Miller, global director of marketing from mardevdm2, will demonstrate how social media is directly impacting revenue and shortening sales cycles. Learn how to execute savvy lead-nurturing tactics that provide deep insight into the readiness and intent of your prospects/customers along with best practices to leverage social media for demand generation.